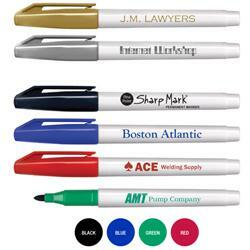 Our Sharp Mark Fine Tip Custom Permanent Markers with your promotional logo. 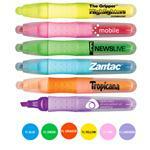 Somewhere in-between our broadline and pocket style permanent ink markers lies Sharp Mark. This permanent marker combines the popular size barrel and pocket clip with a fine point that gets the job done without busting the budget. Low odor, water resistant ink permanently marks on most surfaces such as coated paper, foil, metal, photos, glass, wood, cardboard and plastic, also great for industrial use! Non-Toxic. Comes in many color choices! Available Colors: Black, Blue, Green or Red. Typical Imprint Area(s): 0.875" x 2"
Bulk, 250 @ 6 Lbs.